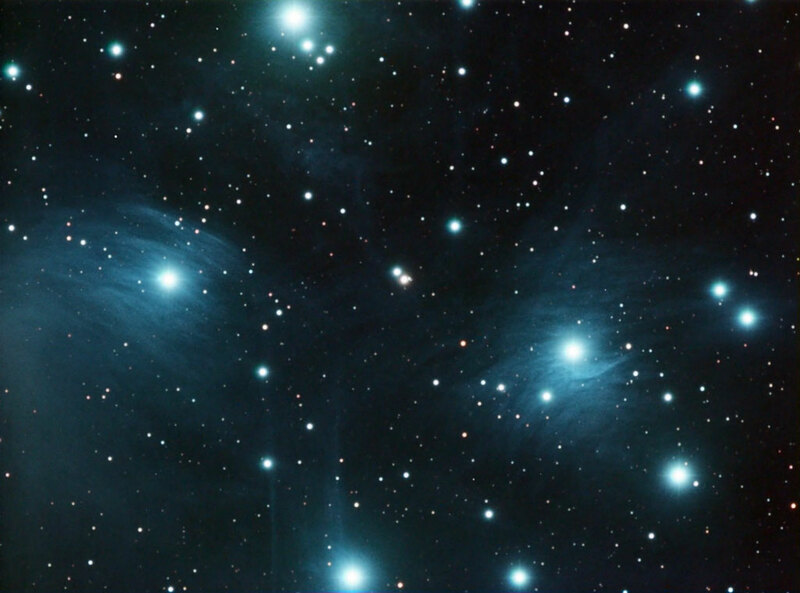 This image of the Pleiades was captured by Steve Chambers on the 17th November 2017. Steve used a Canon 550D camera with a 180 mm lens. The image comprises 57 frames totalling 37 minutes 57 seconds of exposure. Image © Steve Chambers. 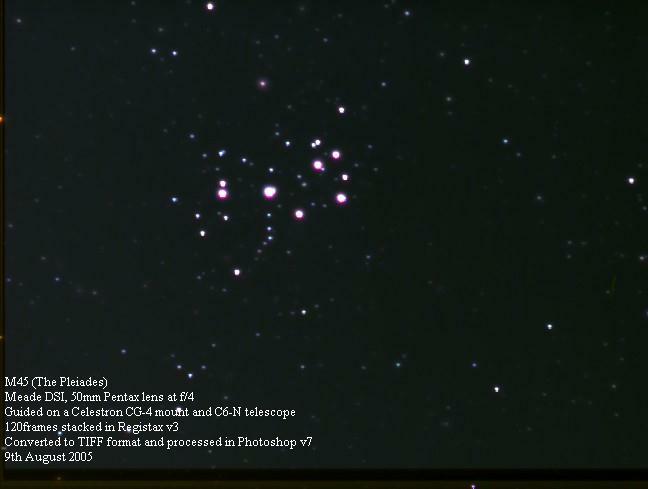 Chris Newsome produced the following image of the Moon occulting the Pleiades on the 7th August 2007. Here is his account: "In the early hours of 7th August 2007, M45 underwent an occultation of the Moon and between about 00:45 UT and 01:30 UT the cluster emerged from the dark side of the Moon. It was a chance not to be missed to try and record the event. So after a late shift from work, I set up my Skywatcher 102T and 80T on the driveway of my house and pointed it at the Moon and took a series of photos. I took them in pairs, one of 1/250th second and one of 2 seconds duration using a Canon EOS300D at roughly 5 minute intervals. Each pair was then merged and blended together to show both the sunlit and earthshine hemispheres of the moon and the cluster. After aligning each of the 'double' frames together in MaximDL, I ran them through Windows Movie Maker and created a video showing the path of the Moon through the cluster. The pair of images taken at 01:38UT were processed to produce the still frame shown below. While I was imaging the event, I was watching through the 80T with a 20mm eyepiece and managed to see the re-appearance of Maia. It was instantaneous and quite amazing to see". Click here to watch the video (209 KB Windows Media file). If you have trouble viewing it straight from your browser right click on the link and save it to your hard disk first. Image © Chris Newsome. 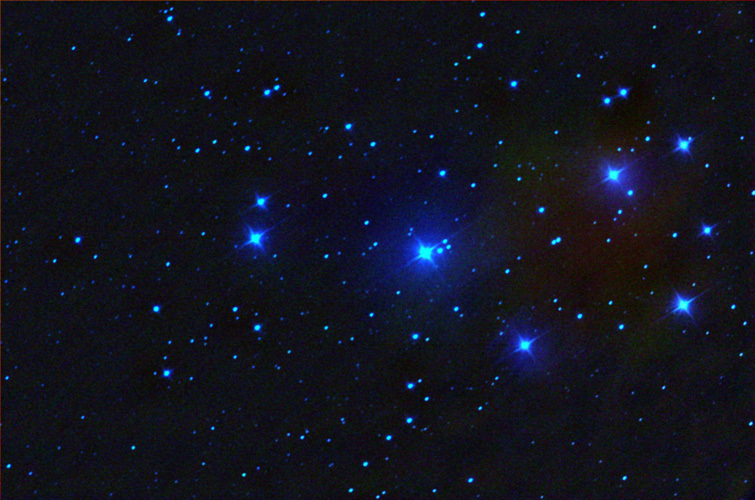 Tony Razzell captured this false colour image of The Plieades on the 18th November 2006 using a 50mm SLR camera lens and an Audine CCD camera. This uses an unfiltered Kodak KAF401E sensor and the image is comprised of a stack of ten 30 second exposures. Tony comments: "One problem that I think I have is the IR image being out of focus (the CCD is sensitive beyond 1.0 micron) when the rest of the image is in focus. I think this is why the stars are a bit big (unless of course I don't have it in focus)!" Image © Tony Razzell. 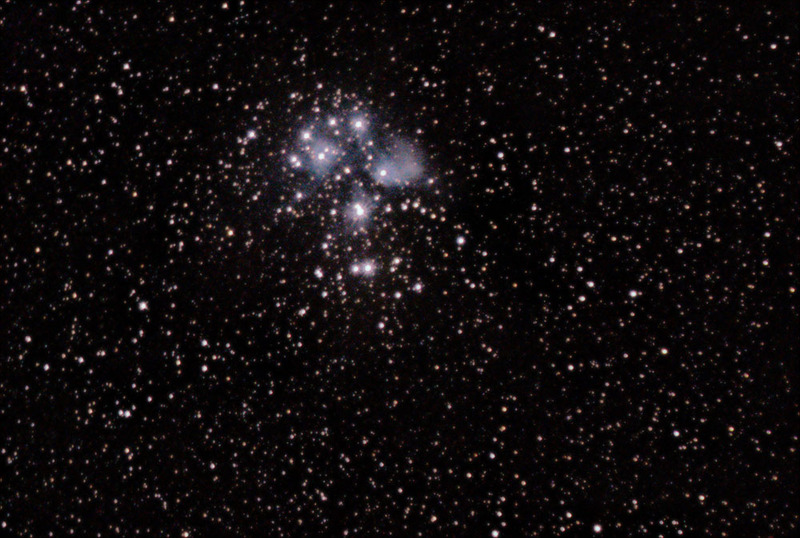 This image of the nebulosity surrounding The Plieades was taken by Adrian Brown over two nights in October 2006. Adrian used a Skywatcher 80ED refractor and an ATK16HR camera. The image is a combination of high resolution luminance data and lower resolution colour data. The colour data was collected with the camera binned 2x2 to speed up the process and try and get as many good colour exposures as possible between the gaps in the clouds. High resolution luminance data was collected through a clear filter to capture as much light as possible. The exposure details are Red 9 x 5 minutes (Bin 2x2), Green 9 x 5 minutes (Bin 2x2), Blue 12 x 5 minutes (Bin 2x2), and Luminance 8 x 6 minutes (Bin 1x1). Processing consisted of using Maxim DL to calibrate and stack the raw exposures. Adobe Photoshop processing consisted of levels and curves, smoothing the background noise and sharpening the detail in the reflection nebula. This image was used by Adrian at the November 2006 DDAS meeting to demonstrate how such a picture is processed. Image © Adrian Brown. 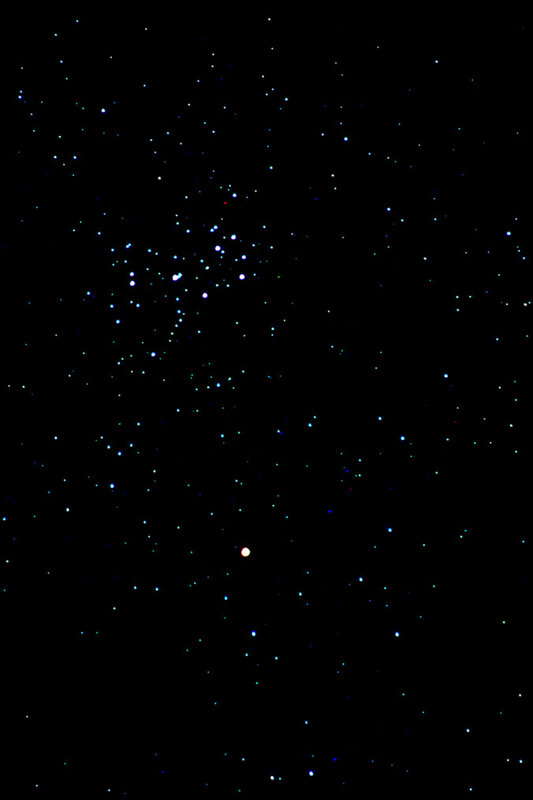 Chris Newsome took this picture of Mars and The Plieades (M45) on the 15th February 2006. Chris used a Canon EOS300D camera with a 185 mm lens at f/5.6 and a 52mm Hutech LPS filter. The picture is a composite of eight images of 75 seconds each at 200ASA and 2 images at 800ASA. Each image was calibrated in Maxim DL using dark subtraction and bias and the resulting image was then processed in CS2 using RGB Levels, Curves and Gaussian Blur. Mars was about 2.5 degrees south of M45 at the time, approximately +0.5 magnitude and about 7 arc seconds in diameter. 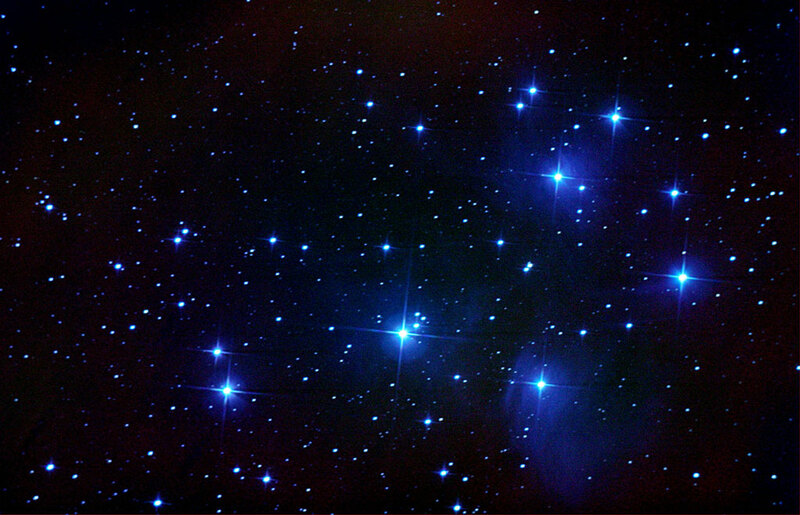 The faintest stars on the image are about 11th magnitude. Chris comments that the whole process of setting up the equipment and taking the 10 images, and then taking down the whole setup just in time before it started raining, took just 30 minutes! The results are well worth it as this image made BAA Picture of the Week the same month! Image © Chris Newsome. 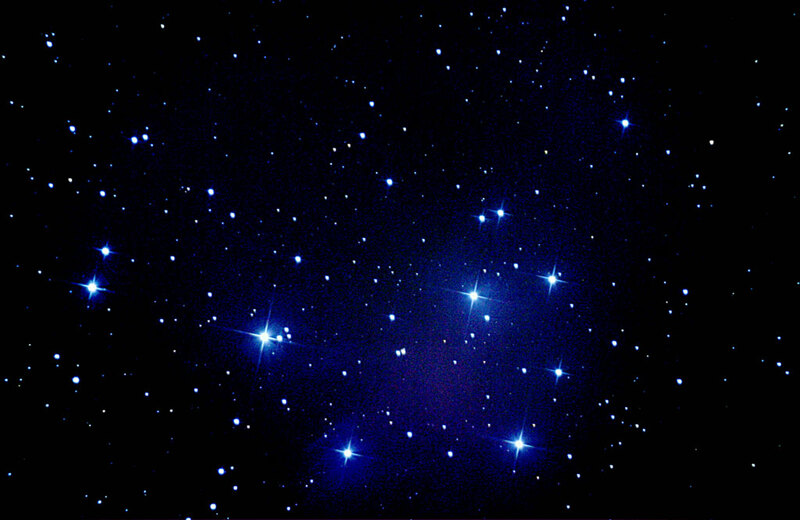 This image of The Plieades was taken by Chris Newsome on the 19th November 2005. He used a Canon EOS 300D camera at the prime focus of a Celestron C6-N. Nine 60 second exposures were stacked and dark subtracted in K3CCDTools and processed in CS2. Image © Chris Newsome. Chris Newsome took the following picture of Mars (top right) and The Plieades (lower centre) on the 1st November 2005. He used a Canon EOS300D camera piggybacked on a driven Celestron C6-N, with a 55 mm lens at 1600 ASA and a Skyglow filter. The image is composed of a stack of 3x30sec exposures in RAW format and converted to 16-bit TIFF. Stack and dark subtraction was done in K3CCDTools V2 and then the image was processed in CS2 (curves, RGB Levels and GradientXTerminator). Chris comments that the focusing was done manually as he didn't have his USB cable at the time to connect the camera to his laptop and utilise DSLRFocus software. Image © Chris Newsome. 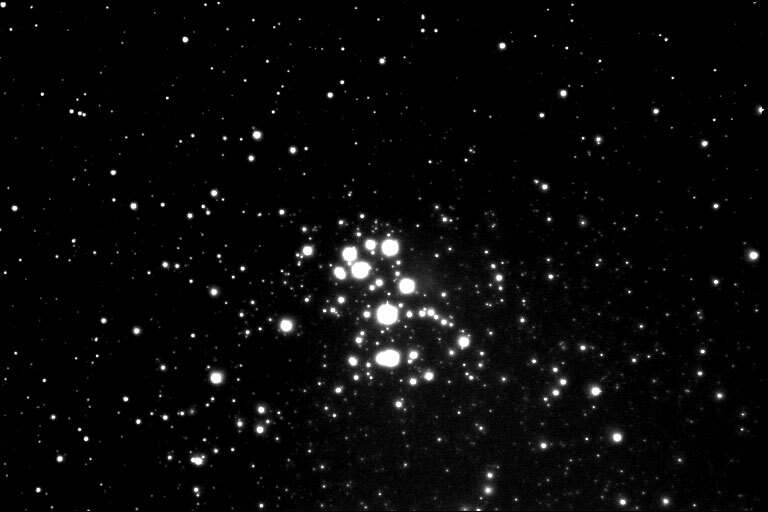 The following image of the Plieades was captured by Chris Newsome on the 22nd October 2005. He used a Canon EOS 300D camera at the prime focus of a Celestron C6-N. It is comprised of 4x60 second images in RAW format, converted to 16-bit TIFF and then stacked in K3CCDTools with dark frame subtraction. It was further processed in Photoshop V9 (CS2) using GradientXTerminator, curves, histogram stretching and colour balance adjustments with assistance from Adrian Brown. Image © Chris Newsome. 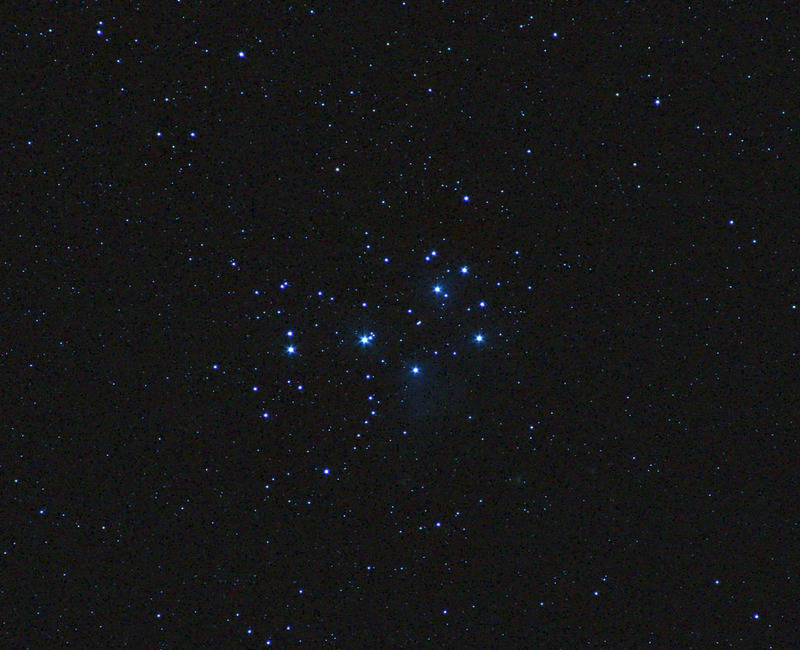 Chris Newsome captured the following image of the Plieades on the 25th September 2005. He used a Canon 300D digital camera at the prime focus of a Celestron C6-N. the image is a combination of two 30 second exposures at 400ASA, stacked and dark subtracted in K3CCDTools (10 dark frames), then processed in Photoshop v7. Some of the nebulosity around the stars is visible. Image © Chris Newsome. 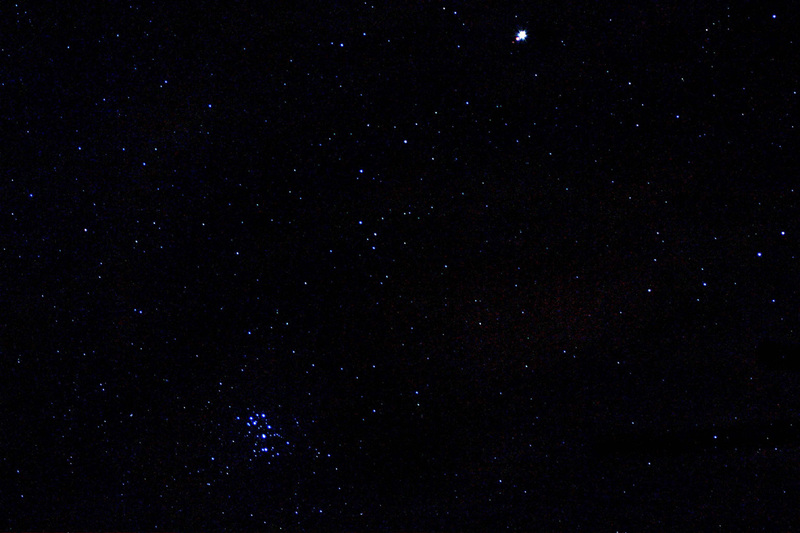 The following image of the Plieades was captured by Adrian Brown on the night of the 2nd-3rd September 2005. The imaging equipment was a Canon 300D DSLR camera with a 200mm focal length lens and a Hutech LPS light pollution filter, piggy-backed on top of a Celestron C11 SCT which was used to autoguide the mount. The two 10 minute exposures comprising the image were taken at ISO 400 to help suppress the buildup of noise. The images were stacked and dark frame calibrated with Maxim DL 4.11 and then further processing was done in Adobe Photoshop via the Curves and Levels tools. Adrian also used a Photoshop plugin called GradientXTerminator to fix light pollution gradients in the image backgrounds. 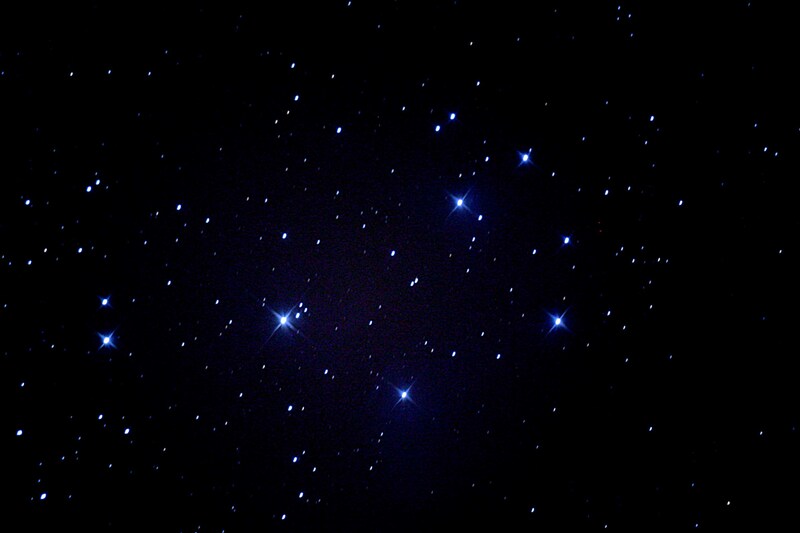 He notes that this clever bit of software really helped the M45 image as it darkened and flattened the sky background without erasing any of the faint blue nebulosity which you can just see surrounding the star Merope. Image © Adrian Brown. 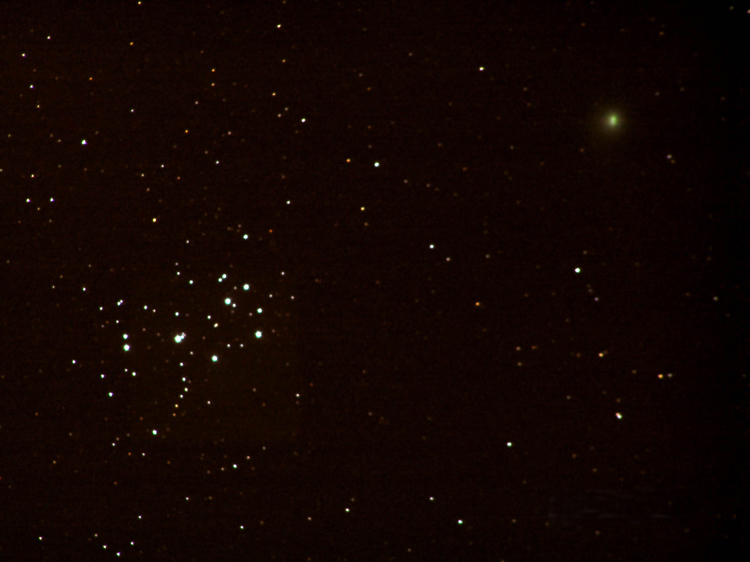 Chris Newsome produced the following image of The Plieades on the 9th August 2005. Image © Chris Newsome. Click here to download a 2.6 MB MPEG video of the Plieades rising over Adrian Brown's back garden on the 9th August 2005. Video by Chris Newsome. The following image shows Comet Machholz (C/2004 Q2) close to the Pleiades and is a combination of 25 stacked images taken by Chris Newsome on the 8th January 2005 from Allestree in Derby. Each image was a 30 second exposure, at a 400ASA setting taken through a 380mm Minolta Z2 Digital Camera, piggybacked on an equatorially mounted Meade ETX-105. The images were stacked and aligned in Registax. The final combined image was adjusted for contrast and brightness in Adobe Photoshop. Image © Chris Newsome. Chris Newsome took the following image of Comet Machholz near the Pleiades on 6th January 2005. 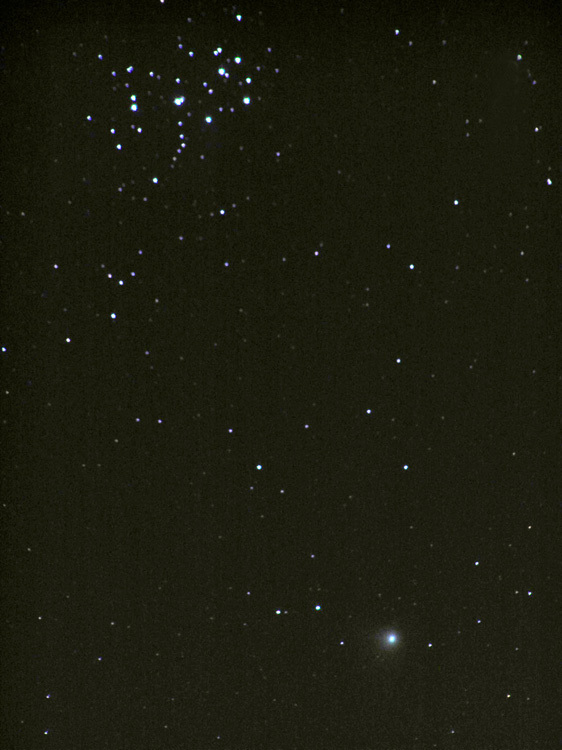 It is a composite of ten 30 second exposures taken using a 380 mm Minolta Z2 camera at 200ASA and f/5. 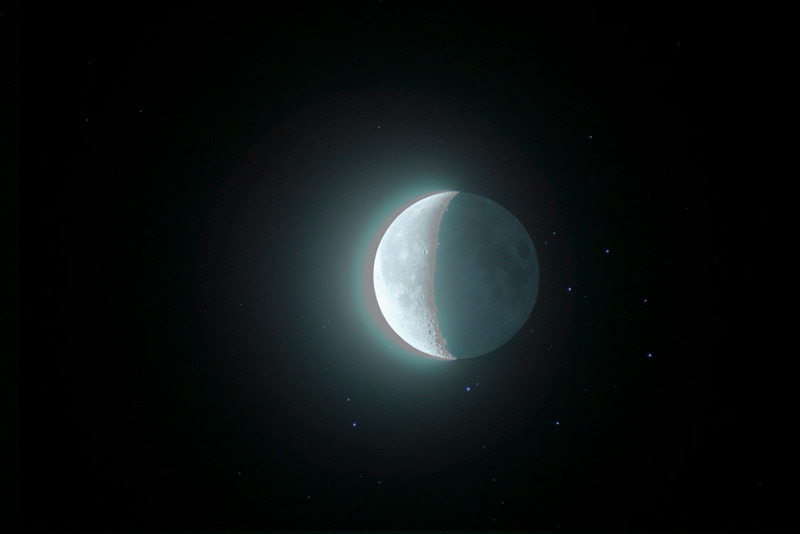 The images were stacked in Registax and contrast adjusted in Adobe Photoshop. Image © Chris Newsome.